In 1980, the Dickinsons sold a bull named “Impressive” for $60,000, a record at that time. The Dickinsons have shipped cattle via “Air Mail” in specially made cattle crates. Using hot irons to brand cattle is the most permanent method used down through history for identification of livestock. Exhaust fans are used to keep humidity down in barns so it doesn’t get too damp, but the bodies of cows create heat. The “Call of the Horns” is an award given to the Longhorn with the largest horns at cattle shows. Longhorns are often referred to as “The Cattle of Kings”. To promote their business, the Dickinson Cattle Company has a giant billboard in the shape of a Longhorn cow with their company information. Some in the Dickinson family have trained steers for riding. Three truckloads of cattle were purchased by Andre “The Giant” Roussimoff from the Dickinson Cattle Company. Cattle are driven in herds, by horse, or All-terrain vehicle. The milk from a Longhorn is very sweet. 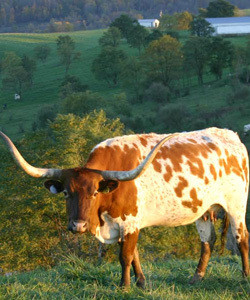 Longhorns were developed in the United States from a few Spanish Andalusian horned cattle to Santo Domingo . No two color patterns of a Longhorn are alike. 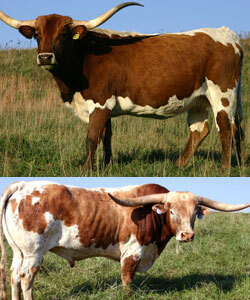 Longhorns have a natural resistance to most common cattle diseases and parasites. The old west is alive and grazing in Belmont County. Interstate 70 bares little resemblance to the Oregon Trail, and Darol Dickinson isn’t a 19th century cattle baron, but at times the view from this Belmont County ranch might seem like a scene from the Old West. The large herd of colorful Texas Longhorn cattle grazing the hillsides of this reclaimed strip-mine land could truly be a scene from the 1870s, but as the case with so many things, what’s old is new again. What’s old is the cattle breed itself. The original Longhorns came to America via the Spanish in the late 1400s. Because they were used as oxen and because the long voyage was so important, “Only the best came over,” Dickinson said with pride. The cattle’s history in what would eventually become the United States mirrors the progression of the young country’s western expansion. Dickinson calls it his “gas station theory.” Eventually there is a gas station on every corner until someone is priced out of business. “Everyone can’t do the same thing and make money at it.” Raising and selling Longhorn cattle is a way of differentiating himself from other breeds in the cattle business. It could be debated whether he and his family are in the cattle business at all. Whereas most cattle are bred for growth, meat or milk characteristics, today’s Longhorns are bred for their colorful, speckled patterns and supersized horns. And as Dickinson recognizes, good marketers sell an image in addition to an actual product. 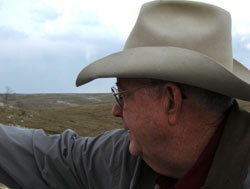 Many of Dickinson Cattle Company’s customers “buy Longhorns to decorate their pastures,” he said. One buyer was an archeologist from Michigan who found the Longhorns to be similar to cattle he studied in Biblical times. So the archeologist bought a bull and seven cows so he could raise the cattle himself. There is a certain irony that the cattle, which faced irrelevance and extinction a century ago, today graze pastureland that was faced with a similar fate 30 years ago. The company’s 5,000 acres of reclaimed strip-mine land has been in its own revitalization process as it has been transformed into highly managed and highly valuable pasture. The Dickinson operation uses a modified rotational grazing system, with the goal of resting each pasture for at least 45 days between grazing, allowing time for each pasture to re-seed. In the 1970s the pastures would have been unrecognizable, with 250 deep coal mines. Once the mining ended, the coal company was legally obligated to restore the land. The limestone subsoil was mixed with topsoil to create what Dickinson considers good pasture ground. Steep banks were reinforced to prevent erosion, and eight inches of topsoil was restored and planted to improve pasture. In 1993 while driving on I-70 through this eastern part of Ohio, the Dickinson family saw that this land could be ideal for pastureland. Dickinson Cattle Company now has up to 1,600 head of cattle on 43 separate, fenced pastures. Once again a trend has come full circle. Today leanness is considered an attribute for cattle. In fact, some cattle breeders have found success in crossbreeding Longhorns to other breeds so that some of the Longhorn’s positive traits – resistance to certain diseases, ruggedness, fertility and longevity – can be passed on to their progeny. It seems the modern day Longhorns have found a balance between practicality and novelty for those in the cattle business like the Dickinson family. “People want what’s different,” he said. ©2005 Ohio Farm Bureau Federation, Inc. All rights reserved. Material provided on this website is acquired from many knowledgeable and reliable sources. However, the material is intended to be informational only; is not guaranteed as to accuracy; and in no way should be considered a preference, recommendation or referral of any specific facility or activity.